Fr. Mark Tomasiewicz grew up on a farm near Humphrey, NE, the third child (he has three sisters) of Felix & Maxine Tomasiewicz and his home town parish was St. Michael in Tarnov. Fr. Mark graduated from Humphrey High School in 1983 and attended college seminary at Conception, MO, graduating in 1987. 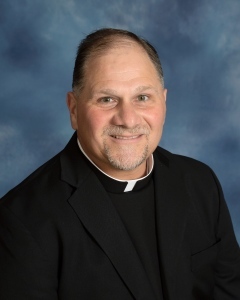 He graduated from Mundelein Seminary in 1991 and was ordained in the Archdiocese of Omaha on June 1, 1991. Fr. Mark has served at St. Bernadette in Omaha, St. Bonaventure in Columbus, St. Columbkille in Papillion, Immaculate Conception in St. Helena/Sts. Peter & Paul in Bow Valley, St. Mary in Laurel/St. Anne in Dixon, St. Mary in Wayne, and St. Patrick in Tekamah/Holy Family in Decatur. Father spent 8 years doing campus ministry at Wayne State College and was in the Air Force reserves from 2003-2009, where he was an Air Force chaplain. Fr. Mark currently serves St. John the Baptist Parish in Petersburg, along with St. Michael's in Albion and has been in residence since June 2016.